My mother is in town, and that means I can sneak down to the shop when my son is asleep. Today I got a rare second day in a row in the shop, and I really wanted to MAKE something. I’ve bought a lot of tools, and even tuned and cleaned/sharpened a few. Today I was set to actually make something, and I did. I am going to be needing to cut some mortises sometime soon, and I didn’t have a good heavy hammer. 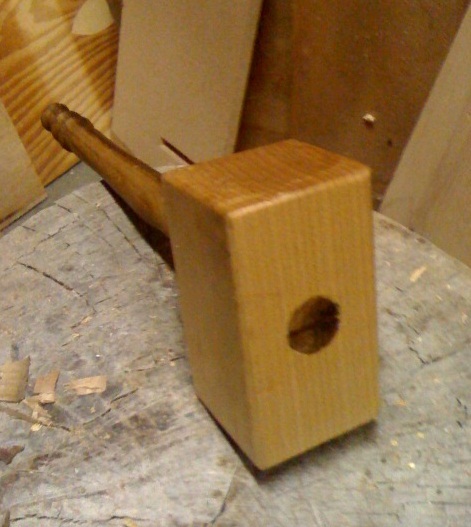 I had my Apple wood hammer I made on the lathe, but it’s a bit lightweight for chopping mortise holes. The Thundergod gets his name from the shape of the handle which makes it somewhat Comic book Thor styled. 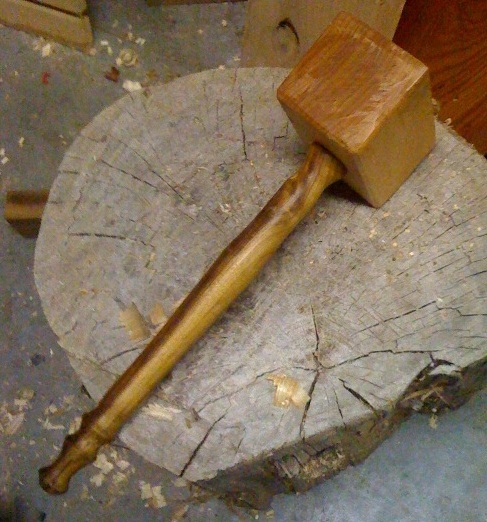 The head is 2 3/4″ Maple wood, and the handle is a bit of Oregon Myrtle I had laying around. The Myrtle had some issues with checking and a big knot hole so I turned it bit more fancy than I was intending on a whim, and get rid of some flaws. To make it I used mostly hand tools. I even tried to use power tools, and that was a mistake. I cut the head on the band saw and it went all kinds of funny directions. I tried to fix it on the belt sander, but it was too much for it and blew a fuse. I ended up using a block plane on the end grain to fix the band saw screw up, but I gotta tell you that thick of maple is hard to work with any tool. To cut the handle I tried ripping it with a hand saw, but the only rip saw I have is dull. So I took a deep breath and sharpened it with a saw vise and files from the old toolbox. I worked surprisingly well, and it cuts quick now. Except my technique or sharpening is off, since the cut kept drift away from the line. I ended up just splitting it out after the saw cut drifted too far. Which of course ripped out a big knot hole. 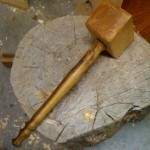 I turned handle on the lathe (powered, but I’m not giving that up totally, it’s too much fun.) I had to cut in a lot near the top to turn away most of the hole left from tearing out the knot. I turned a fancy end for fun, and made it fit my hand. 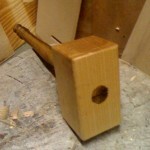 The top shoulder led to a 1″ shaft for the hammer head. I was going to drill out the top on my drill press, but again my 1″ fornster bit is kaput. So I pulled out the auger bits I got in a roll at an antique store ages ago, and tried the 1″ bits. The first one was so dull it did nothing (note to self, must learn to sharpen these bits) but the second one cut quick. Well sort of quick, this is nearly 3″ maple. But I made my way through it, fairly straght and only sweating a bit. (I lie. I sweated a lot.) A little glue, a walnut wedge, and some walnut oil finish, and voila! 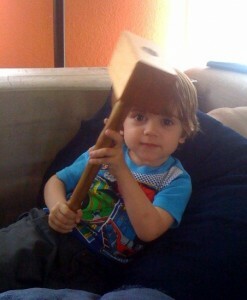 My son seems to approve. Thanks for an interesting read. I came across your site whilst surfing the web, and soon realised there is a lot of fine content here. It will keep me happy, until I can get back in my shop. I hope there are a few more readers; because I know that blogging can about as rewarding as dropping a bucket into a dry well. Just so long as you know I am out here looking in! I am glad to hear that some one is enjoying it. I am keeping my self doing it mostly to chronicle my own adventures. I love reading others, so it’s kind of fun to share too.